What's the absolute best product I could think of buying? One that's totally unique and completely my own. So the fact that I was recently able to create my very own Prescriptives Custom Blend Lip Gloss just, well, tickled me pink all over! Prescriptives does quite a large business of custom blending. Whether you're looking for your very own foundation or concealer, eyeliner or lipgloss, the brand can make it happen. And my product of choice was lipgloss -- because no matter how many of these babies seem to find their way into my makeup bag, it's just never enough! 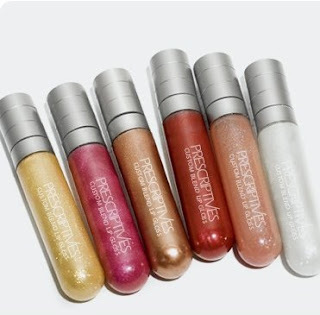 I took a trip to the counter at Bergdorf Goodman over the weekend to finally make my dream of having a lipgloss that was uniquely my own come true. It's a truly amazing process! Tons of bottles in every color imaginable sat on the counter arrayed before me, while the lovely girl behind the counter asked me questions like whether I wanted a matte or glossy base, if I wanted shimmer or sparkle and even what kind of tube I wanted it contained in. I went for a peachy pink with a hint of shimmer, and then chose Vanilla Melon for the flavor. And then it was just time for me to sit back and watch as color after color and shimmer after shimmer were added to a syringe and pressed into my very own tube! The result was the perfect shimmery peachy pink that I've been looking for my entire life. I've decided to call it -- what else! -- The Beauty Chick. Check out prescriptives.com, where you can create your very own tube, or head to any Prescriptives counter. One tube retails for $26. I've always been curious about these -- the custom blend looks awesome! I would make my own but probably it will wind up look like every sheer pink lippie I already have, haha.